Murudeshwar is small town in North Karnataka and most famous for its second largest statute of Lord Shiva and the temple complex surrounded on three sides by the water of the Arabian sea. 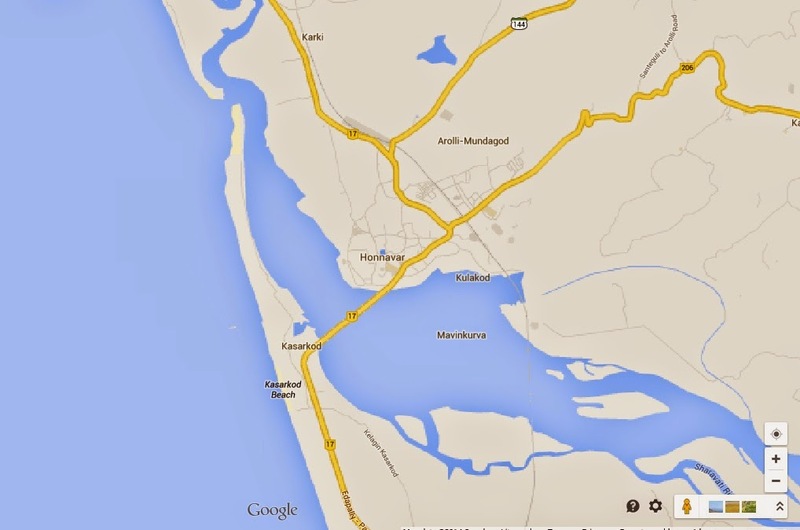 Honnavar town has Arabian Sea to the west and river Sharavati to the south, forming an estuary. The river joins the Arabian Sea at Honnavar. While joining the sea, the river has created some islands. 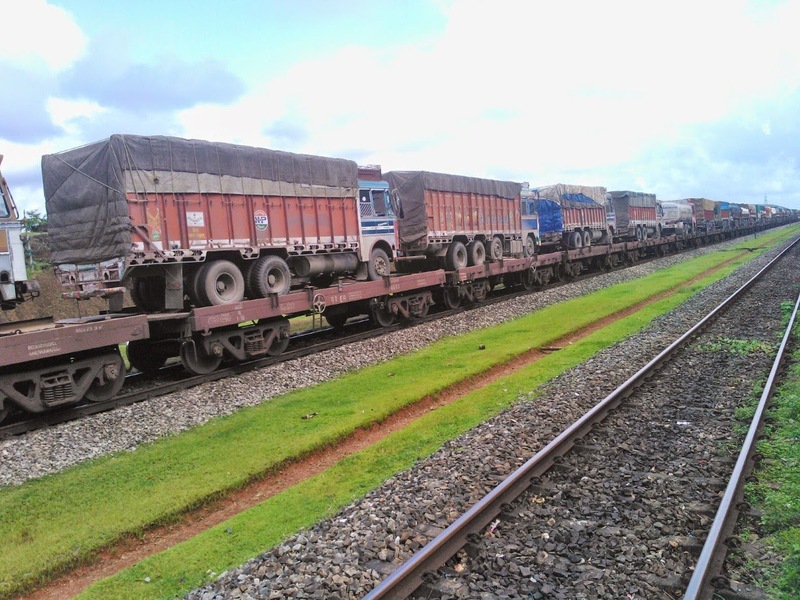 Konkan Railway line passes through Honnavar. 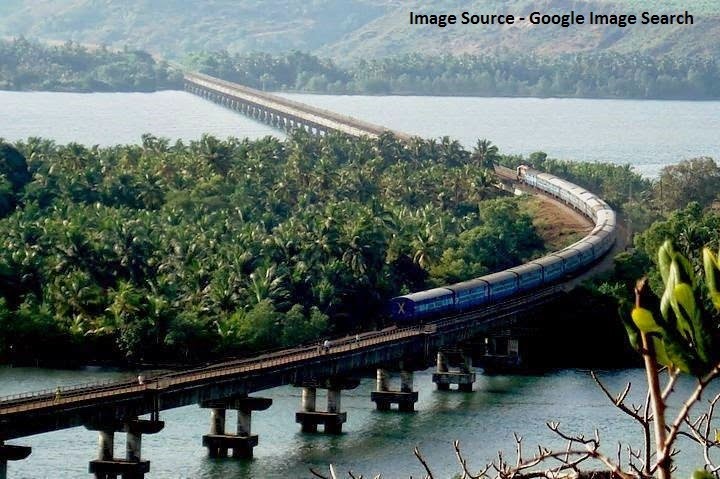 Konkan Railway's longest bridge (2.065 km in length) is in Honnavar over Sharavati River. Murudeshwar is 30 km (NH 17) and Jog Fall 62 km (NH 206) from Honnavar. We decided to stay in Honnavar, so that we could cover both the places plus we would be exploring another unknown and unexplored place. Murudeshwar is easily accessible from Honnavar. We took the Karnataka State bus from bus stand and within 1 hour we reached Murudeshwar. Temple complex and beach is around one and half km from the main road. We decided to walk and after some time we could easily see the big shiva statute and 20 storied Gopura. Before I write more about this place, let me tell you very interesting legend behind this Shiva temple. It goes back to Ramanyana time when Ravana king of Lanka was worshipping Lord Shiva, so that he can achieve immortality and power. After many years of worship and prayer finally Lord Shiva appeared, pleased and granted his wish. Lord Shiva gave one Atmalinga to Ravana and warned he should not place it on the ground until he reach home. When other Gods came to know this, there were afraid, they thought now Ravana will become more powerful by worshipping the linga daily. So all the Gods conspired to take the linga away from Ravana. They all knew that Ravana is great devotee of Lord Shiva and punctual in performing rites and prayer every day after sunset. When Ravana is on the way to his home, near Gokarana, Lord Vishnu blocked the sun with sudharshana chakra. Ravana thought its evening now and he should perform the prayer. But he was confused whether to put down the Atmalinga or skip the evening rites. Then Lord Ganesha appeared, posing as bramhin boy. Ravana saw him and asked for his help. He said that hold the Atmalinga until he complete his prayer. The boy agreed on the condition that he would keep the linga down if Ravana didn't return before the boy called out his name thrice. Ravana agreed and went about his rituals, but by then the boy called out his name thrice and placed the Atmalinga on the ground and left. The Atmalinga firmly rooted to the ground, it became light again. Then Ravana realized that he was tricked by the Gods. Ravana was deeply upset and tried to uproot the linga. Angry, furious ,he used all his power but was unable to uproot it from ground. It took the shape of a cow’s ear, and the place came to be known as Gokarna (Go means cow, Karna means ear). Disappointed Ravana threw the cloth wrapping the linga, and it fell around 50 km south at present day Murudeshwara. The temple has 240 feet tall Gopuram at the entrance, among the tallest. The door is guarded by two majestic elephants. You can go by lift to the top to have a view of the beaches, the temple below. Unfortunately when I was there lift service was suspended because of maintenance work. The gigantic Lord Shiva statue is 122 ft tall and second tallest statute of Lord Shiva (Tallest is in Sanga, Nepal 143 feet high). The statue looks sparkling and the reason is its designed such that it gets the sunlight directly. The temple here is very old, the credit for construction of new temple complex, gigantic statute of lord Shiva and tallest gopuram goes to R.N.Shetty. He also has some hotel and resort in Murudeshwara. RNS Residency is near the temple and facing Arabian sea. There is one more near the beach Naveen Beach Resort. The murudeshwar beach was full of fisherman and fishing boat. Crowded and lots of noise around but you can get a great view, glancing up at the statue of Shiva on the hilltop. We spent some time on the restaurant nearby, had very good lunch and good view of temple complex. We preferred the top floor of the restaurant, it was quiet and pleasant sitting there. Visiting Netrani Island was also in our list. This coral island is 20 km from Murudeshwar and more popular for scuba diving. Our bad luck, it was not possible to reach there at that time and scuba diving was stopped because of monsoon season. So we had more time in Murudeswar, roaming around the town and beach. Now it was time to go back to Honnavar and this time we decided to take the train. 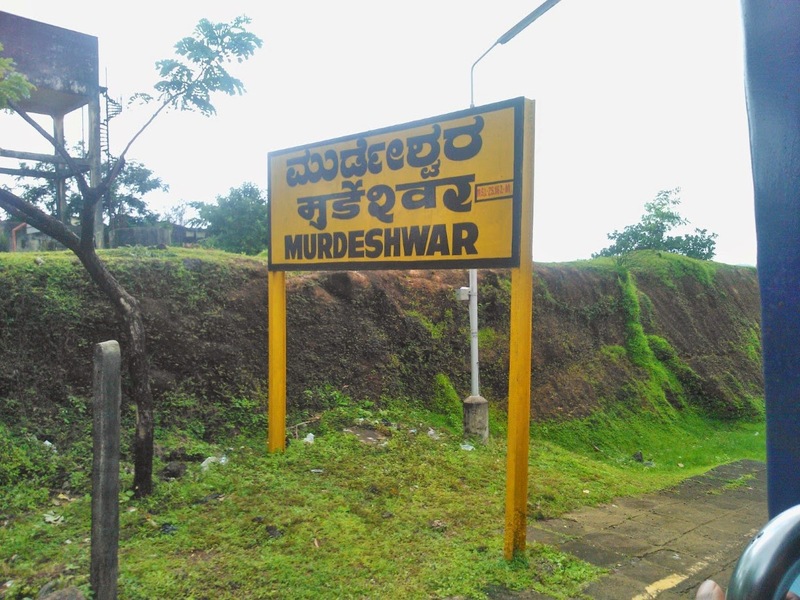 Murudeshwar has one small railway station and very few train stops there. Checked the timing of trains and then we reached the station on time. Excited to take the Konkan railway route and we knew that we will be going through the big tunnel and picturesque railway bridge near the Honnavar. Initially we best possible window seats for sightseeing but later preferred to stand at the door. It was really amazing experience, Greenery around, coconut trees, forms, river, hill area, big tunnels. Overall Murudeshwar trip was great, I am not so religious but it’s good to visit such historical places . If you religious than this place is must visit for you. Whatever you are but you can forget your religious beliefs, disbeliefs, visit the Murudeshwar temple town because of its picturesque setting.